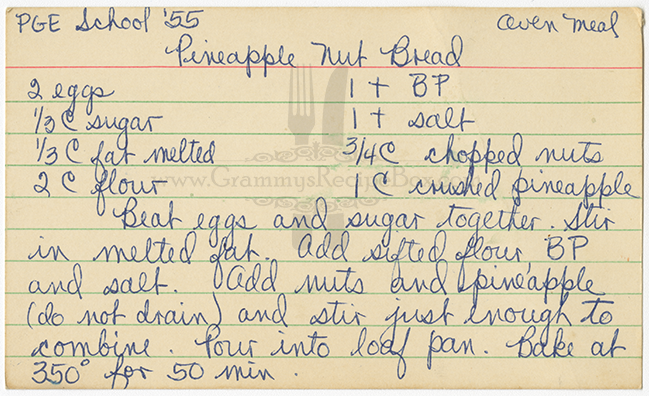 This recipe is written in Grammy's handwriting. 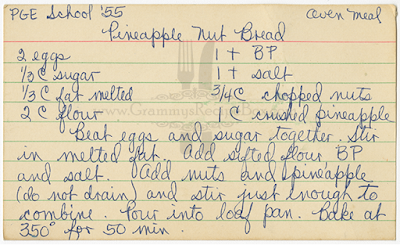 It is dated 1955 and is attributed to "PGE School" with the note "Oven Meal". PG&E stands for Pacific Gas & Electric. They had (and still do have) a significant presence as a large landholder in Plumas County because of the hydro power plants that were built along the Feather River. I know there were (and still are) several mountain camps that were PG&E. There is still a PG&E school in Quincy. I wonder if that's where she got this recipe.